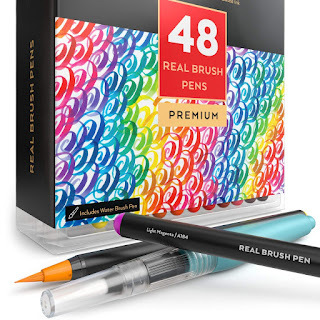 Right now you can get these *HIGHLY RATED* Zrteza Real Brush Pens, 48 Colors for Watercolor Painting $26.59 (Retail $136.63). -Amazing Quality for the Money: Try them &amp; see for yourself. These premium paint pens offer richer colors &amp; finer, more flexible tips than you'd get with costlier brands. Value pack provides 48 pens. -Endless Creative Options: Use your Arteza Paint Brush Pens with water to create delicate watercolor effects. Or, use without water for dry-brush painting, sketching, coloring, calligraphy &amp; more. -Mess-Free Watercolors: These paint markers give you precision control, so you can easily do everything from light pastel washes to subtle shading &amp; gradients. Without fuss, muss, mess, or worry. -Like Real Brushes (Only Better): Each brush pen has a soft, supple tip made of durable nylon brush hairs. Use the tip's tapered point to create thin lines. Brush down for thicker lines &amp; strokes. -Safe, Nontoxic &amp; Guaranteed: ACMI-certified for safety, your Arteza painting &amp; drawing pens come with our special promise: If you have problems, just let us know &amp; we'll send you a free replacement. *Prices can change at anytime. Shipping is FREE.